Filled with surprises, these miniature galvanized buckets make crafty and inexpensive wedding favors (galvanized pails- bulk packaged). 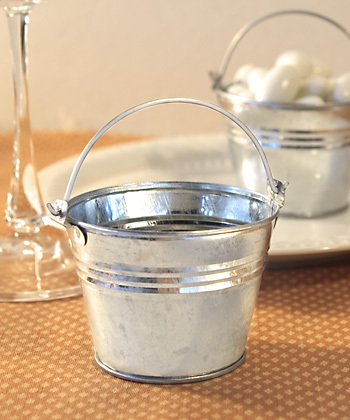 A tiny version of their full sized counterparts these miniature galvanized buckets are an adorable selection as inexpensive wedding favors. Also delightful for a shower or any garden party, the mini galvanized pails can be filled with candy or potpourri to make inexpensive wedding favors that your guests will love. Each approximately 2" tall with handle, these sturdy galvanized pails can later be used as containers for small items such as jewelry, paper clips, etc. Our miniature galvanized buckets are sold bulk packaged.